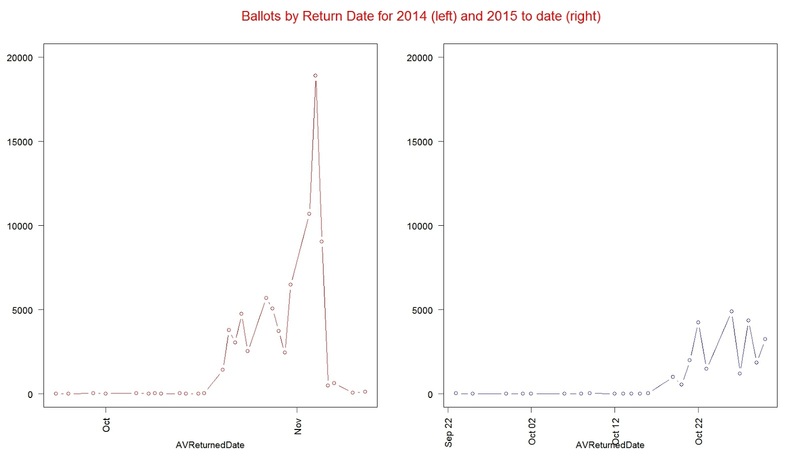 To date (10/30/2015), 24.2K 'Good' ballots have been returned out of 129.7K registrants. My data shows 24.9K ballots total have been returned to date vs. 32.7K ballots this date last year for the entire county. 9.5K ballots total have been returned to date vs. 12.4K ballots this date last year for the city of Bellingham. 41K have not returned ballots in Bellingham. The top twenty precincts for Ballots marked good are below. Please note that South Bellingham and 'WWU' precincts are appearing strongly in the top 20 now including precincts 244, 249, 250, 251, 264. Subsets of Bham Precinct ranges (e.g. "b.x>. "Total Registered (Active) Voters: 129734"